Medicine Lake campground closed to non-American Indians July 17-21. 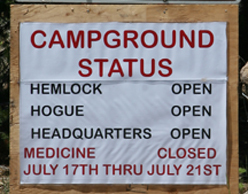 In July, 2003, the first annual traditional campout was held in Medicine Lake campground, for 3 days. A local church inquired about using the same campground for spiritual reasons, but they were told it was not possible unless we were American Indians. At that time, they camped with the rest of us. In 2006, the Indians went into other campgrounds and took their picnic tables, telling the campers that this land and everything there belonged to the tribes. So in 2007, the Forest service kicked out all the white campers, and will again this year, from Medicine Campground, during the 5th annual traditional event next week. Last year they walked around the lake, took a private kayak from a camper and used it for a bridge so they wouldn't get their feet wet (It belonged to a KBC editor), and hung out on private property and docks. If you belong to other Indian tribes, you are welcomed to enter Medicine Campground July 17-21. During the first couple years, many Indians ended up in Bartell, lost, because they'd never been to this lake before. HERE for Medicine Lake page.